Good news; you found out where that chewing gum went. The bad news is it’s on your coat sleeve. Or your comforter, or carpet. The easiest way to remove gum and get your carpet clean again is to use Lestoil from ReStockIt.com. Lestoil was made by Clorox as a degreaser for grease and stain remeval, and is especially good at removing gum from all kinds of fabric. Before paying a professional carpet cleaning service, get your carpet clean by diluting Lestoil in warm water and spraying the carpet generously. Let it soak for a few minutes (it can be left overnight safely too). Then work the carpet stain over with a scrub brush and wipe it clean with a towel. 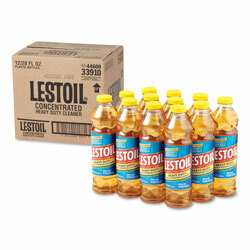 Lestoil is appropriate for removing grease and stains from every surface in the home. If you have carpet stains, need to get gum out of clothes, or if your carpet is looking a little dingy, buy a bottle of Lestoil and try it out. You’ll make your carpet look brand new. ReStockIt.com carries Lestoil and many other cleaning supplies, often with free shipping, and can deliver them as fast as 1-2 business days!